I’ve been mindfucking myself lately. I’ve been searching continuously for my personal strengths that I could develop into “my life’s work”. Something I had an inborn talent for that would give me a biological advantage over others. I’ve done the MBTI-test, Clifton strengthsfinders, DISC-assessment, enneagram and tons of introspection to find that illusive pot of gold – which was nowhere to be found. The whole nature vs nurture debate is mainly confusing and down-right ridiculous. I’ve never liked the schooling system who (cost-efficiently) teaches many students in bulk. I’ve always hated disliked group assignments, big crowds and frivolous/unstructured trips. I get mentally tired really fast from heavy stimulating environments whilst others seem to be “recharged” by them. I need a lot of quiet/down-time to recuperate myself. Yet – I’ve always been forced to be more outgoing, speak up more, make faster decisions and become more sociable altogether. Since the talkative, decision-maker has been idealized (Oprah, Bill Clinton, …) as opposed to the reserved cerebral type (Warren Buffett, Bill Gates, …) in our current society. But here’s the thing; both can thrive equally well – if put in the right circumstances. In a world of 7.3 billion you have to find the things you’re strong at and build your career around those. The world is simply too competitive of a place to not put yourself up for a biological advantage. There’s many different aspects that need to be taken into account before you should pick a career yet you may stumble in the dark as no-one has really ever taught you about this subject. People always say; “You can become whatever you want to be”. You just need to find your one true passion and you’ll be able to glide across the rainbow on your pink, fluffy unicorn. Ok – maybe not so literally. “A person can only perform from strengths, and cannot build performance on weakness. It’s imperative to find your strengths to position yourself in environments where you’ll be able to thrive optimally. You often come to the conclusion that other peoples’ good fortune is derived from a factor outside of their control, that their favorable achievements can be attributed to circumstances. Wow, little Tommy passed all his exams. Yeah he got that intelligence from his parents! Jimmy can’t sit still in class? He’s always been unruly..
Jenny broke up with her boyfriend? Yeah, she’s very emotionally unstable. Additionally we’re mostly oblivious to the inner workings/habits of other people and underestimate situational factors. And hey – it’s actually necessary for increasing our self image since some studies suggest that depressed people have a more objective self-image whilst generally happy people have a more positively biased (read: delusional) view of themselves. Why am I saying all this you might ask? Point being: Humans are poor judges of others performance by having an excessive self-regard tendency (which is necessary for your self-image), are oblivious to what goes on on the inside of another person and overvalue situational factors in others’ good fortune. This obscures your view of talents and the actual work involved. Talent does not exist in my opinion. They’re just projections of social bias combined with an excessive self-regard tendency that needs us to explain why others are doing better than us. The things that matter most for expertise (the ability to provide consistent, near-perfect performance) is deep domain expertise (knowledge) combined with hours and hours of beating on your craft. 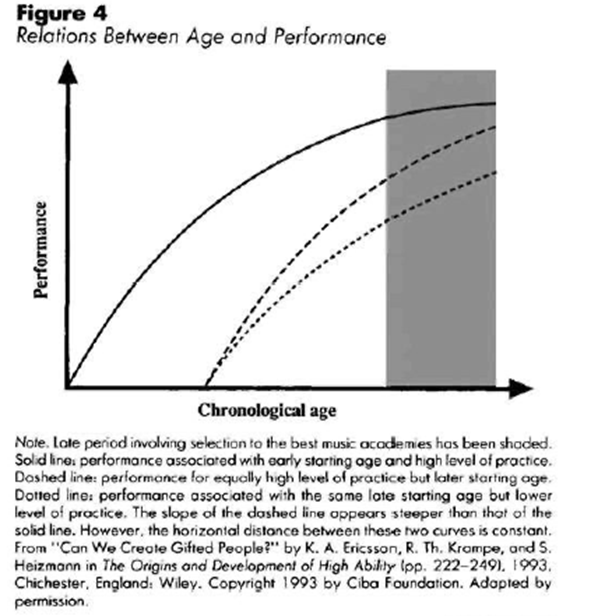 The most important accelerating factor being the age you start. Child prodigies? Not so much. Remember golf-god Tiger Woods? He must’ve gotten that wicked golf-gene-talent at birth! The most talented/naturally gifted player of all time? Mozart? The musical genius and piano prodigy? He started composing from age five and was immersed in music from birth. It’s what they’ve been wired to do after constant exposure to these subjects. It’s what they’ve been born to do. Ascribing peoples’ success to talent makes us feel better about ourselves – yet it’s a myth. Start as young as possible and develop deep domain expertise by hours upon hours of beating on your craft. Many people look for their talents and passions to “develop their life purpose” not knowingly they design it themselves. Skipping from subject to subject never really sticking with something they can build up to expertise level. Become Who You Want To Be? Humans are not born as blank slates. As any mother of two can (anecdotally) confirm that their two toddlers where not alike from the very beginning. Temperament is the governing factor for separating and selecting individual strengths. Temperament refers to inborn behavioral/emotional patterns that are observable in infancy and early childhood. What later will form your “personality” is a blend of this inborn temperament, your cultural influence and personal experiences. The most heavily studied subject in temperament (and most important IMO) is the difference between extroverts and introverts. The “man of action” and the “man of contemplation”. The source for this difference can be found in the amygdala of our brain which is part of the limbic system (an evolutionary ancient structure in the brain – meaning it has been there a looong time already). “Introverts” have more highly excitable amygdala. The amygdala is the part of the brain that receives your sensory input (5 senses) and tells the rest of the brain and the nervous system how to respond. 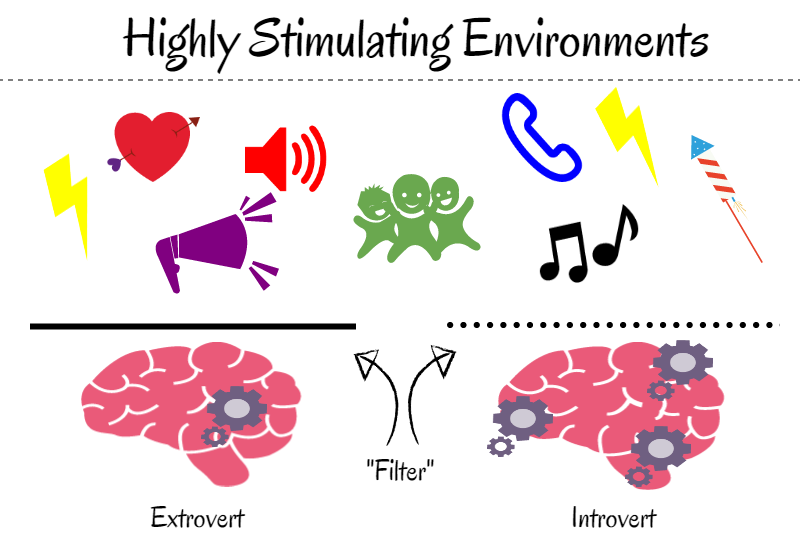 Introverts react more strongly to sensory input because they have excitable amygdalas. Children with highly excitable amygdala have a higher heart rate, dilated pupils, tighter vocal chords, more cortisol in their saliva (stress hormone) and have more rapid eye movements when processing information. It indicates a lot about the amount of stimulus a person enjoys. You can see introversion and extroversion as a “filter” from the outside world. Introverts respond more heavily to stimuli which “drains” their mental batteries. They prefer calm environments to perform optimally and “recharge”. They become bored less rapidly. Extroverts require higher level of stimulus to perform optimally. They “come alive” under people and heavy stimulating environments. They are bored more easily. The point is finding an environment that’s suited to your desired level of stimulation so you can perform optimally. Alright, what’s the deal Simon? How come they are this different and what’s the advantage of this? The low-reactive (extrovert) is the go-getter in the world, always geared to react with the stimuli provided and has a thicker filter for the world making him better suited to accommodate the competing demands on his attention (BIG reason for why they are so social). He likes to be in highly stimulating environments and will perform best in those. He gets bored more easily. He’s more aggressive & outgoing. He has commonly more sexual partners compared to introverts caused by his gregarious nature. The high-reactive has a thinner filter for the world, taking in stimuli more deeply. These are the ones that could spot danger faster than others. The ones that observe and process their environment more deeply which enabled them to avoid many dangers, failures and wasted energy. They process information to make optimal long-term decisions. A quick way to test if you’re a high reactive/introvert is by squeezing a few drops of lemon juice on your tongue and see how heavily you react to that by producing saliva. The point of all this is finding a happy medium between over-stimulation and boredom to function optimally. Because introverts are more sensitive to stimuli they’re most likely to excel in theoretic & aesthetic fields which provide a low stimulating environment. Fields like music, nature, art and physical beauty. Jobs like programming, science fields, music, bodybuilding (not really a job), writing, inventing, financial planning, engineering (any kind), investing, designing, consulting are strong-suits for introverts. NOTE: Temperament can be stretched to do tasks we would normally refrain from (public speaking, networking, parties, … ) IF it’s about things we consider important. It’s like a rubber band – which can be stretched – but not indefinitely. We still perform optimally under our biological nature. We’re getting pushed by society to be more gregarious, take on more group work to stimulate “creative thinking”. We encourage the rapid decision-makers but don’t promote introverted strengths. Don’t listen – just position yourself where your strengths are able to shine. Everyone has an inborn temperament but there’s no such thing as biological predispositions for certain skills (e.g. talents). Team up with a member of the opposite temperament to gain valuable insights and profit both ways! To become an expert in a field (and you must) I’d advice to choose something you’re already good at (and you like) and build on that. BUT if it’s totally not suited to your personality – switch. Introverts will never be top-performing news anchors, party hosts, pr managers or group coaches. The point I’m trying to make is to play according to your temperament to put yourself in places that can be used to further develop your strengths. I believe any skill can be learned trough practice and there’s no such thing as inborn talent but there are certain areas in which you excel better because of your biological disposition. And that’s exactly the advantage you’ll need. Are You An Introvert? How Has It Influenced Your Life? Anyway, thanks for reading the article. If you have some more questions or input – leave a comment in the section below. As usual I learned something reading your post. Yes, my career (writing) suits me just fine. Yeah this one is mainly geared towards introverts (I guess that’s my main audience anyway). Take note that the tests are just indicators – not absolute truths. Don’t let yourself be defined by four letters. You can stretch where necessary.